Syria talks in Vienna to force Obama to make tough calls. 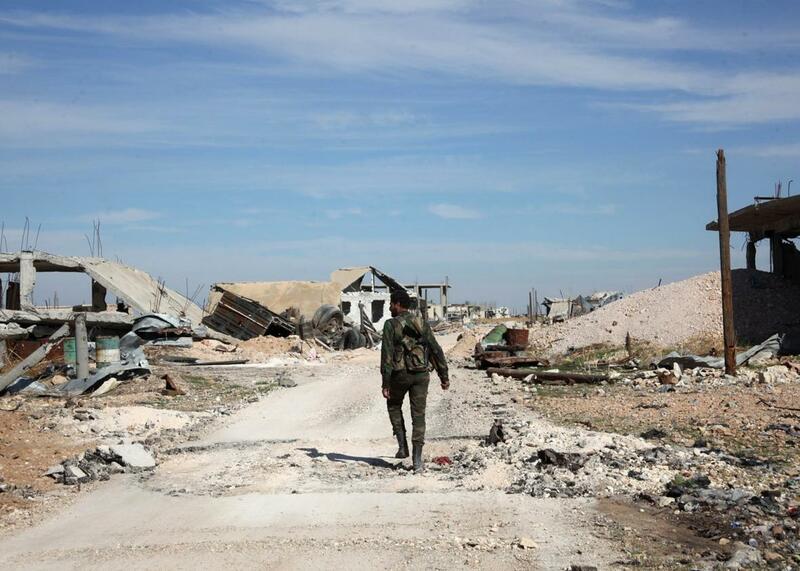 A pro-government fighter walks down a road in the Syrian town of Arbid on the outskirts of Kweyris military airbase, in the northern Syrian province of Aleppo, on Nov. 12, 2015. A key meeting is scheduled for this weekend in Vienna to help decide the political future of Syria. Naturally, no Syrians are invited. The Vienna meeting follows initial talks on Oct. 30 between more than a dozen governments—including the United States, Russia, and, for the first time, Iran—where they agreed to launch a new effort to reach a cease-fire between the Assad regime and rebel groups in the 4½-year-old conflict that has destabilized the region and created an unprecedented global refugee crisis. One of the main topics of debate at this weekend’s meeting is likely to be who, from Syria, should be invited to future negotiations. The thinking up until now has been that if the major international players in the conflict can agree on a peace plan, it will be easier for them to coax their Syrian proxies into cooperating. But sooner or later, Syrian groups are going to have to sign on, which has prompted a major debate over which groups are considered legitimate opposition and which are terrorists. Everyone agrees that ISIS and al-Qaida affiliate Jabhat al-Nusra should not be part of any deal, and any cease-fire agreement would allow airstrikes to continue against them. Saudi Arabia, Turkey, and other regional governments are pushing to expand the list of legitimate opposition groups to include several Islamist factions, including some that have cooperated at times with Nusra. Russia, meanwhile, considers most of the rebel groups fighting Assad to be terrorists, including the “moderate” groups backed by the U.S., and there are concerns that if a cease-fire were signed, Russia would simply continue to bomb anti-Assad rebel groups under the guise of fighting Jabhat al-Nusra. Ahead of this weekend’s meeting, Russia has released a new peace proposal that involves Syria drafting a new constitution within 18 months followed by early presidential elections. It makes no mention of whether President Bashar al-Assad would step down during the transition period, a key demand of Syrian opposition groups, who have largely dismissed the proposal. As Karen DeYoung of the Washington Post notes, the Obama administration will soon have to make several tough decisions on Syria, including whether it would agree to a deal that allows a transitional role for Assad and which rebel groups should be allowed to participate in the political process. The issues will come up both at the Vienna talks on Saturday and at a G-20 summit in Antalya, Turkey, which begins on Sunday. Turkish President Recep Tayyip Erdogan says Syria will be a major topic of conversation at the summit, which will include President Obama and Russian President Vladimir Putin. While the politicians talk, events are moving quickly on the ground. The Russian-backed Syrian military broke a yearlong ISIS siege of an airbase in Aleppo this week, which could allow Russian jets to use the base for more raids against anti-Assad rebels. The army, along with fighters from Hezbollah, also captured another town held by non-ISIS rebels today. In northern Iraq, Kurdish peshmerga forces backed by U.S. air support launched a new offensive to retake the ISIS-held city of Sinjar. The hope is that the offensive could cut supply lines between Raqqa and Mosul, ISIS’s Syrian and Iraqi strongholds. An assault on Raqqa, with at least some participation by U.S. special forces, may happen in the next few weeks, though the offensive so far has been slow-going and hampered by political infighting.